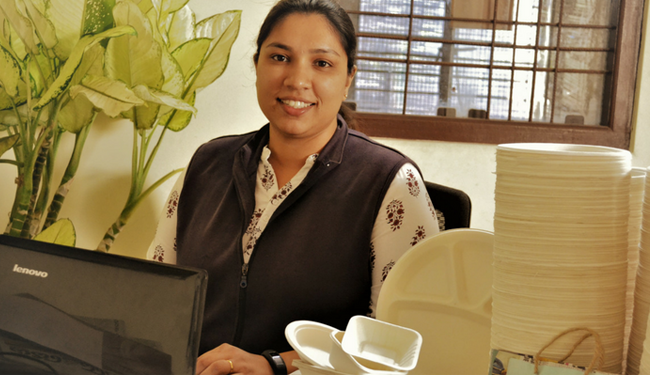 Samanvi Bhograj started a manufacturing unit that makes 100 percent biodegradable and compostable tableware products using plant fiber. Plastic has become integral parts of our lives. It has seeped into every little shelf on the corner and has made our lives completely dependent on it. Right from the cradle to the grave most of the products in our daily usage come with plastic. In this plastic-filled world, Samanvi Bhograj, a 31-year-old from Bengaluru, is showing an alternative in the form of cutlery made out of sugarcane bagasse. Samanvi is a third-generation entrepreneur; her father and grandfather started and ran a steel forging company back in 1963. Her natural instinct and interests were also in pursuing entrepreneurship, but at the same time, Samanvi also wanted to create something that would add considerable value to the society and environment. Earthware, founded in 2011, started off with corn-based products such as bin liners, cover for the textile industry, and cutlery.